Danielle grew up in Southern California and has always been passionate about animals. When she was younger she owned many pets, including a horse, hamsters, rabbits and cats. She decided she wanted to make a career working with animals when she was nine years old and attended an animal camp at the zoo at Moorpark College. 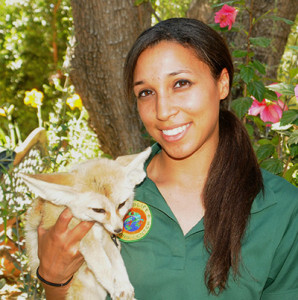 Danielle received her Bachelor of Science in Biology from San Diego State University, taking many animal related classes. By far, her favorite class was in animal behavior. After graduating, she worked at the San Diego Safari Park caring for lorikeets. She also completed an internship at the California Wolf Center in Julian, California, caring for wolves. Now that Danielle is a part of the Wildlife Learning Center, she can give excellent care to the huge variety of animals and also to educate people about wild animals and their importance to our environment.